The Delhi High Court decriminalised begging in the national capital, striking down several provisions of the Bombay Prevention of Begging Act as unconstitutional. The bench comprising Acting Chief Justice Gita Mittal and Justice C Hari Shankar observed, "The State simply cannot fail to do its duty to provide a decent life to its citizens and add insult to injury by arresting, detaining and, if necessary, imprisoning such persons, who beg, in search for essentials of bare survival, which is even below sustenance. A person who is compelled to beg cannot be faulted for such actions in these circumstances. Any legislation, penalizing the people therefore, is in the teeth of Article 21 of the Constitution of India." Four months later, the high court also abolished the Beggars' Court. In a path-breaking decision, the Delhi High Court opened the gates for women to enter the Territorial Army. "Women are eligible for recruitment and appointment to the Territorial Army under Section 6 of the Indian Territorial Army Act, 1948". A bench of then Acting Chief Justice Gita Mittal and Justice C Hari Shankar held that advertisements imposing a blanket ban on the appointment of women to both departmental and non-departmental battalions of the Territorial Army were without any credible, reasonable or compelling justification for imposing such restrictions. State through CBI V. Sajjan Kumar & Ors. The Delhi High Court convicted Congress leader Sajjan Kumar in a 1984 anti-Sikh riots case. A bench comprising Justice S Muralidhar and Justice Vinod Goel set aside a lower court order that had acquitted him of the charges. In doing so, the bench reportedly said, "It is important to assure the victims that despite the challenges truth will prevail." In another judgment, Justice Gauba upheld the jail terms of more than 80 people for their involvement in the 1984 anti-Sikh riots and directed the prosecution to re-examine evidence on 22 unexamined homicidal deaths. 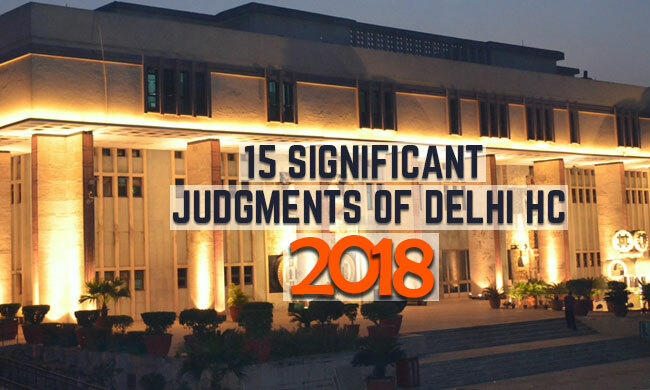 The Delhi High Court set aside the trial court judgment that had acquitted 16 Provincial Armed Constabulary (PAC) officials in the 1987 Hashimpura mass murder case. The court convicted all the accused and sentenced them to life imprisonment. "Family of the victims had to wait 31 years to get justice, and monetary relief cannot compensate their loss," observed the high court bench of Justice Muralidhar and Justice Vinod Goel while delivering the judgment. The Delhi High Court held 20 more people guilty of killing a 60-year-old Dalit man and his physically-challenged daughter at Mirchpur village in Haryana's Hisar district in 2010, while dismissing the appeals filed by 15 convicts against the various sentences awarded to them. The bench comprising Justice S Muralidhar and Justice IS Mehta also upheld acquittals of 21 other accused, holding that there was insufficient evidence to establish their guilt. Gautam Navlakha V. State (NCT of Delhi) & Ors. Taking a strict view of a series of non-compliances of various mandatory legal requirements, the Delhi High Court set aside the August 28 order of the Chief Metropolitan Magistrate (CMM) granting transit remand of Gautam Navlakha, one of five rights activists under house arrest in the Bhima Koregaon case, to the Maharashtra Police. A bench of Justices S Muralidhar and Vinod Goel set aside the CMM's order granting Navlakha's transit remand to the Maharashtra Police while also refusing to extend his house arrest as it noted that neither the CMM took into account material available with the police to necessitate Navlakha's arrest nor was Navlakha informed about grounds of his arrest. In a rather unusual judgment coming on the heels of the Supreme Court's Hadiya verdict, the Delhi High Court recognised that threat to the right of choice of a person and thereby right to life, liberty, privacy and dignity can very well come from the person's own parents and has directed the parents of a girl to pay her compensation of Rs 3 lakh for forcibly picking her up from the residence of her music teachers and detaining her in a mental institution where she was forced to spend one day and one night in "clear violation of Section 19 MHA read with Article 21 of the Constitution of India". Women should be honoured and treated with dignity at the workplace, the Delhi High Court said while asserting that employers should be sympathetic towards pregnant women and mothers. Justice Suresh Kumar Kait observed, "Women who constitute almost half of the segment of our society have to be given due weightage and honoured and treated with dignity at places where they work to earn their livelihood." Shadab Khairi & Ors. V. The State & Ors. Providing solace to lonely senior citizen couples fighting legal battle with their ill-treating sons and daughters-in-law who refuse to vacate parents' house despite court orders, a division bench of the Delhi High Court held that maintenance tribunal has the jurisdiction to pass an order of eviction under the Maintenance and Welfare of Parents and Senior Citizens Act, 2007. Christian Louboutin SAS V. Nakul Bajaj &Ors. In an important judgment dealing with the violation of trademark rights by e-commerce platforms and the extent of protection/exemption enjoyed by them, the Delhi High Court held that when an e-commerce company claims exemption under Section 79 of the Information Technology Act, it ought to ensure that it does not have an active participation in the selling process. The presence of any elements which shows active participation could deprive intermediaries of the exemption, Justice Prathiba M Singh observed while decreeing a suit against Darveys.com filed by Christian Louboutin. Horlicks Ltd. & Anr. V. Heinz India Pvt. Ltd. The Delhi High Court held that advertisement is a facet of commercial speech which is protected by Article 19(1)(a) of the Constitution of India and the same can be restricted only in accordance with law enacted under Article 19(2) of the Constitution. Justice Manmohan was considering a suit filed by Horlicks Ltd for damages and permanent injunction restraining infringement, disparagement and unfair trade practices against HEINZ India Private Limited (Complan). Senior Advocate Chander M Lall represented the former and Senior Advocate Amit Sibal appeared for the latter. A Delhi High Court bench of Justice S Ravindra Bhat and Justice Sanjeev Sachdeva, while determining the meaning of the phrase "prejudicial to the sovereignty and integrity of the country", held that mere act of seeking political asylum no ground for denying passport and it cannot be said to be prejudicial to sovereignty and integrity of India. Competition Commission of India & Anr. V. Oriental Rubber Industries Pvt. Ltd. Though upholding the right of parties summoned by the Director-General (DG) for investigation under the Competition Act to be accompanied by advocates, the Delhi High Court directed the DG to ensure that 'the counsel does not sit in front of the witness; but is some distance away and the witness should be not able to confer, or consult her or him'. Social Jurists, A Civil Rights Group V. Govt. of NCT of Delhi & Anr. The Delhi High Court quashed a circular which proposed to deny certain facilities for treatment in a government hospital for patients who do not hold a valid Voter ID Card of Delhi being categorised as a non-Delhi patient. The High Court held that discrimination in health insurance against individuals based on their genetic disposition or genetic heritage, in the absence of appropriate genetic testing and laying down of intelligible differentia, is Unconstitutional.